NOOK, Aloft Kuala Lumpur Sentral: A Futuristic Contemporary Restaurant with a Local Taste! The Latest Contemporary Dining Scene in the City! NOOK, one of the latest dining scenes in the city is nestled in Aloft Kuala Lumpur Sentral. Echoing the hotel’s contemporary and modern interior design, NOOK’s ambience will make one feel like they have just walked into a futuristic air space restaurant. Boldly design with a smart casualness, NOOK offers an all-day-dining experience with a mixture of international and local cuisines. The restaurant is surrounded by glass walls, making it look really spacious and bright. The contrasting and bright color theme of apple green and white with a mix of light wood and steel added much contemporary touch to the whole place. Even the wait staff is smartly uniformed in matching green shirt and white pants. One will be mesmerized by the groovy wavy contemporary light fixture and the padded wall panels of green and white. Diners can choose to dine at the spacious regular dining furniture or go for the sectioned cabin booth for a different feel. The cabin booths, aero-dynamically designed, reminded me of some air space booths. NOOK is totally funky in a futuristic way! At the end of the restaurant, a 360 degree buffet bar is beautifully dressed in white with gorgeous glittery globes of tiny lights hanging in the air. Everything is widely displayed on the long white bar with additional side bars filled with neon lights on ice. The view of the acres of city lights at night also sets the mood at NOOK. Dishes served are a bit of everything from International to local dishes. That evening, we checked out a few dishes and dessert. A thick patty dressed with beef bacon, cheese, greens, caramelized onions and served on sesame seed bun with side salad and thick steak cut fries. The beef patty is juicy and flavorful. I like the caramelized onion adding a smoky depth to the burger. The unique side salad is pretty good as well. Honestly I have never had Sarawak Laksa before. I do have to say the gravy of this laksa is unique and redolent of lots of spices. It’s not the unctuously creamy kind but rather a thin broth punched up with spices. Served with chicken slices and blanched prawns, bean sprout, egg omelette and coriander, the thin rice noodles soaked up the flavors happily. Since I never had this before elsewhere, I don’t have a comparison though I thought it tasted pretty smooth in flavors on my palate. A national favorite, the version here comes with a spiced up fried chicken drumstick, squid sambal, boiled egg, fried anchovies and peanuts and served with cucumber. Though the rice is average, the fried chicken is gorgeous in flavors and textures. A bite of the chicken evokes lots of flavors from the spices and the aroma of curry leaves. I also like the squid sambal for its sweet and spicy flavors. This is my favorite dish of the night! Everything was near perfect in this dish. The fluffy fried rice was filled with loads of umami flavors. Making it even better was the fried chicken, spicy sambal and a tangy pickled papaya kerabu. You literally get a plate of spicy, savory, sweet, tangy and umami flavors all nicely balanced up. It’s just darn awesome fried rice in my books! Another hawker favorite, the chicken rice is served with steamed chicken and fluffy chicken rice. Alongside the chicken rice are chili sauce, ginger sauce and dark soy sauce for extra flavors. This was pretty good but I simply prefer the awesome fried rice I had prior to this dish. Definitely not what I was expecting in a chocolate cake! Love the creative touch as it is a push-pop chocolate cake. One gets to enjoy this layer by layer or simply eat this like a Popsicle. Its layers of chocolaty goodness are something you certainly don’t want to miss! Besides the a la carte dishes above, buffet dinner is always available for those who seek varieties at NOOK. Priced at RM78+, enjoy seafood on ice, cold buffet dishes and salads, noodles, dim sums, hot international and local dishes and lots of desserts to end the evening. After an evening dinner, guests may want to head up to Aloft’s Mai Bar on the 14th floor. Check out the city skyline and the infinity pool while sipping cocktails or simply hang out and enjoy the evening with great company! US Potato Culinary Festival KL 2013: Going Wild with 38 Titillating US Potato Dishes! One Potato, Two Potato, Titillating us with 38 US Potato Creations! Talk about spud invasion! A recent invite to the US Potato Culinary Festival KL 2013 had my jaw dropped as I ogled at a long list of creations made using my favorite root vegetable, the potato!! Potato lovers alert… 16 leading Malaysian chefs show off their prowess in the US Potato Culinary Festival KL 2013 organized by the US Potato Board. Come this June, The US Potato Culinary Festival KL 2013 celebrates the launch of more than 38 dishes in 13 F&B outlets comprising restaurants, eateries, pubs and hotels etc. These F&B outlets are set to serve customers a wide and interesting repertoire of dishes comprising mains, appetizers and desserts using US frozen potatoes as the key ingredient. From 1st to 30th June, customers at these 13 outlets will have the opportunity to taste US potatoes used in various types of Malaysian fusion, western and eastern dishes. The objective of this festival is to promote the enjoyment of US frozen potatoes in a variety of innovative menu items. When one thinks about frozen potatoes, the first impression is probably Shoestring Fries, Curly Fries or Potato Wedges which often accompany steaks or burgers. This is about to change as there are just no boundaries what one can do with frozen potatoes… at least from what I can see here at the festival! Malaysia is a melting pot of cuisines. As such, I wasn’t surprise to see all the various variations of potato dishes from all our cultures. Going through some of them, I was really impressed with the creativity and effort put out by all the participating chefs from the 13 F&B outlets. The versatile spud is showcased from the very first appetizer course to main and snacks before finishing with potato desserts. US frozen processors offer the widest variety of menu-enhancing frozen potato products from which to choose. Malaysians will have the opportunity to taste different types and shapes of US frozen potatoes during this promotion from whole frozen baked potatoes to specialty fry products. We got an opportunity to sample some of these creations at a special media event held at the Sime Darby Convention Centre for the auspicious launch of the festival. 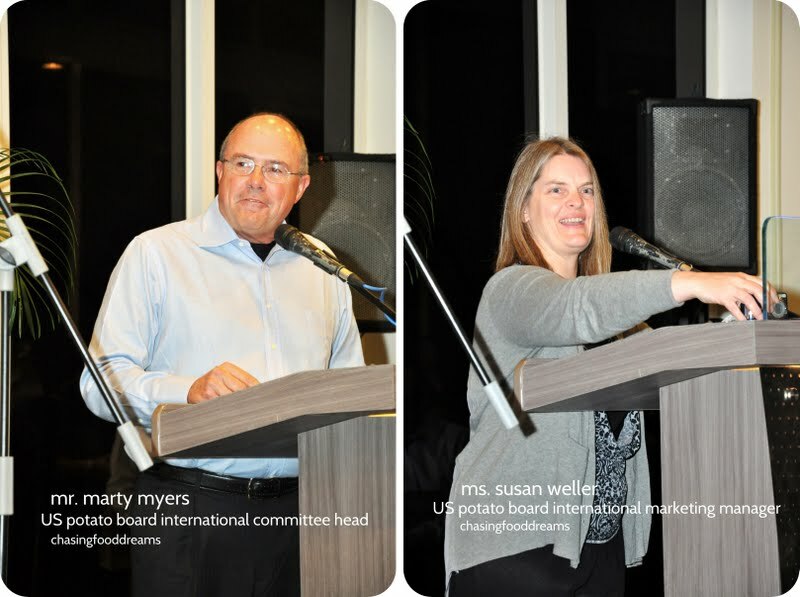 The event took off with several speeches by several US Potato Board Representatives and Committee Heads together with US Agricultural Attache. Though every dish oozes with creativity, dessert takes the cake for me! The US Potato Crème Brulee was deliciously beautiful at sight and taste. I detected a mild potato note in the crème but it seems to work out really nice. I never expected to like Deep Fried Steak Cut US Potato Sugar and Sesame Seed Coated but I really love it. Obviously inspired by the toffee coated sticky Chinese dessert, potato seemed to taste really well sweet and caramelly. Making potato into dessert certainly changes my perception and I doubt I will ever think of the spud as before! So hurry to these outlets to enjoy US potatoes like never before! 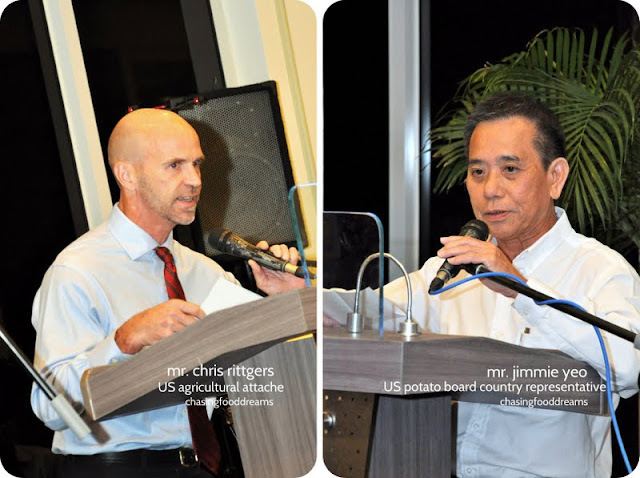 For more information on the US Potato Culinary Festival KL 2013, please call Kent Low or Eddie Saw at (03) 8070-7216.